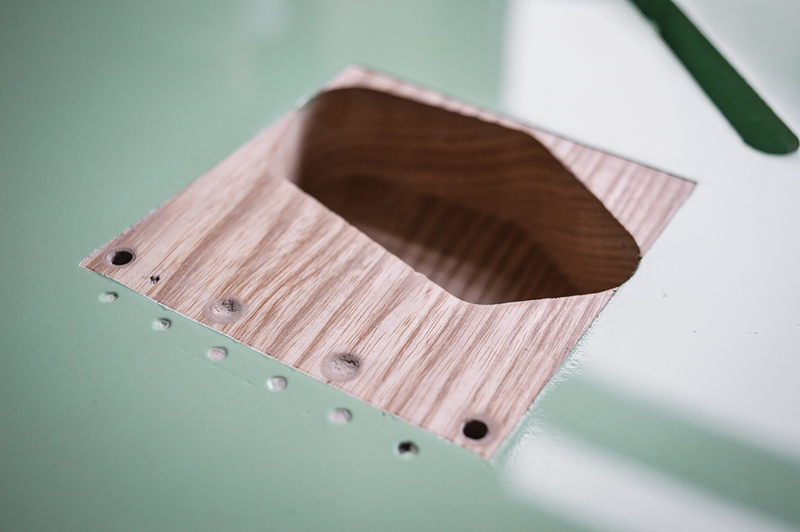 We have previously covered the process of finishing a guitar body and will no doubt do so again in one form or another. 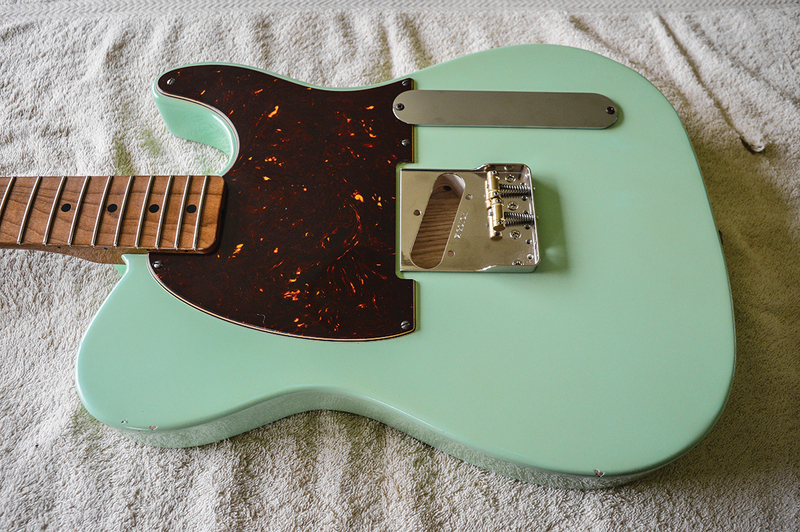 So the starting point for this project is a finished and polished body with a nitrocellulose finish. This could be a body you have sprayed yourself with the intention of distressing, or a factory finish on a body of a guitar you own already. 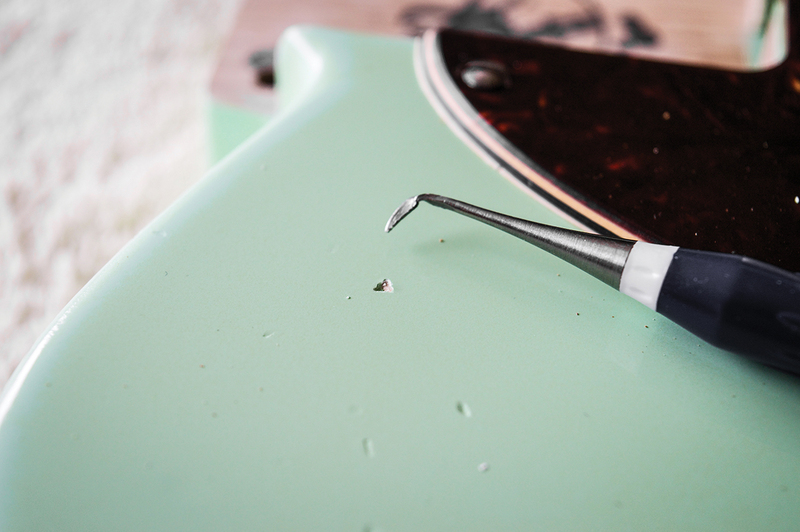 The crucial bit is the nitrocellulose finish because if it’s poly, oil, acrylic or anything else, none of the following techniques will work. This project was enjoyable because there was no pressure to create something vintage authentic. 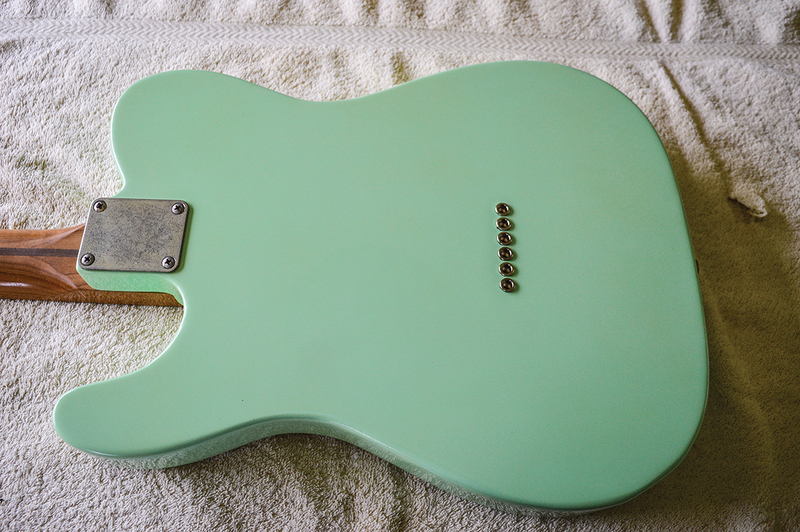 The brief was merely a Surf Green finish with medium distress and lots of lacquer checking. The body was a swamp ash T-style finished with clear cellulose sealer coats, a white base coat, Surf Green and several layers of light tint and clear lacquer. 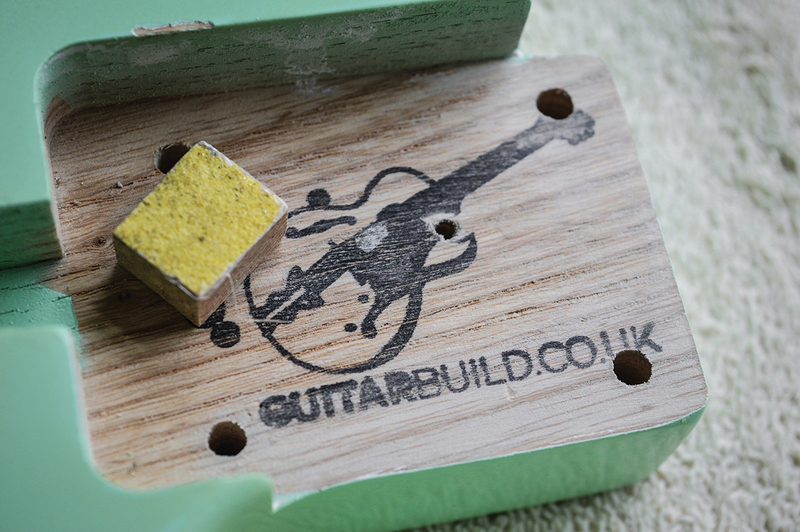 All the finishing materials came from Steve Robinson at Manchester Guitar Tech, and we would highly recommended that company. 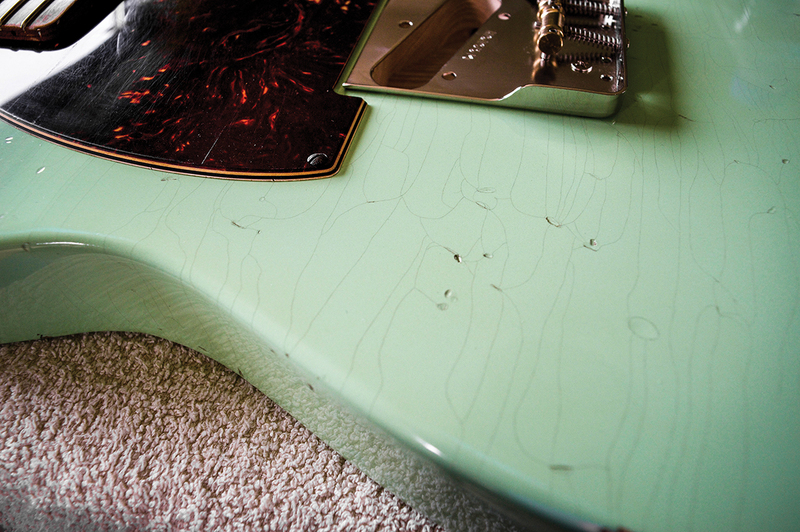 Much is made of the tonal benefits of wood-to-wood and wood-to-metal interfaces, with neck pockets left unfinished, and the likes of Eric Johnson advocate the removal of finish beneath the bridge area. Working on the assumption that no harm could come from that approach and it may actually result in enhanced tone, I decided to try something new. Over the years, I have built a handful of acoustic guitars and it’s common practice to apply masking tape to the front in the area where the bridge is destined to be. Wood glue is designed to stick wood to wood and not wood to lacquer, so the masking tape makes it quicker and easier to expose the bare wood after the finish has been applied.With that in mind, I carefully masked off the area under the bridge, following a line just inside the outer edges of the bridge plate. The tape had to be left in situ until the finish had cured properly and the cutting and polishing process had been completed. To remove the tape, I scored around the edges with a craft knife then cut across the middle of the pickup rout. I peeled the tape from the outside in to reduce the risk of causing damage to the finish. I followed the same procedure for the neck pocket, cutting the masking tape just inside the outer edges of the neck pocket . After removing the tape, I sanded away the overspray with a small block. 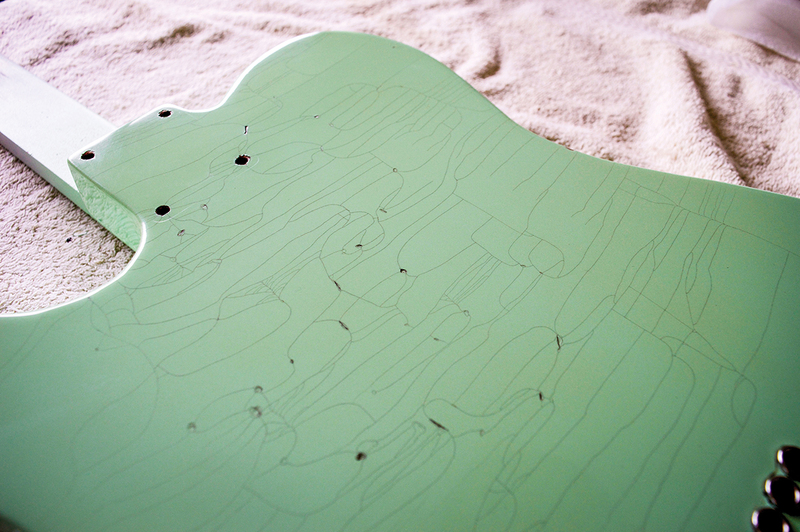 When this guitar is finally assembled, both the neck and bridge will be coupled directly to the body. 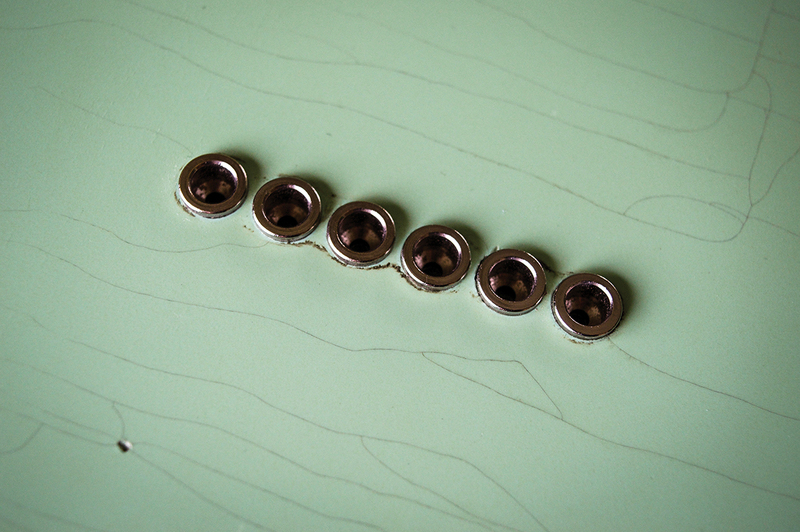 At the start of this process, you may well find yourself staring at a shiny and pristine finish. This will be your final opportunity to ask yourself if you really want to go through with the process, because there’s no going back. 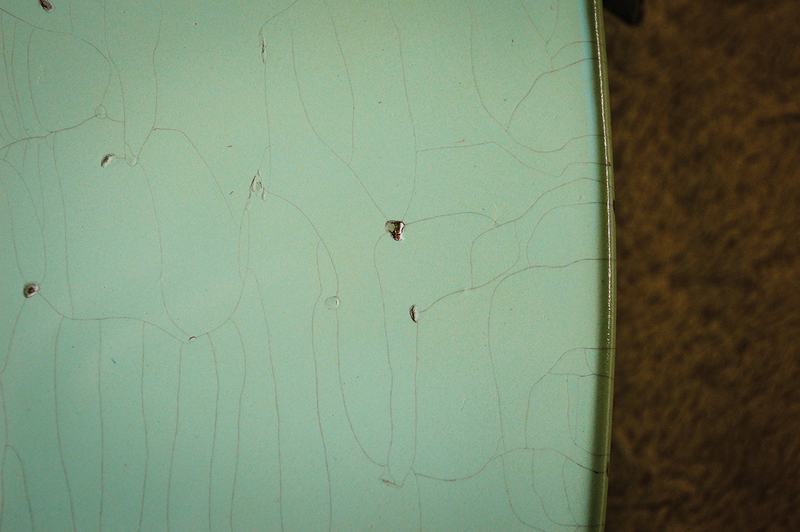 My approach is to begin by adding dings, dents and chips to the finish because when I get the lacquer to check later, the lines will form around these marks. Look closely at genuine vintage finishes and you’ll see that’s how things tend to happen in the ‘natural world’, and it can look amazing. Like the guys at Fender and Gibson, I collect several bunches of keys and simply drop them onto the body. 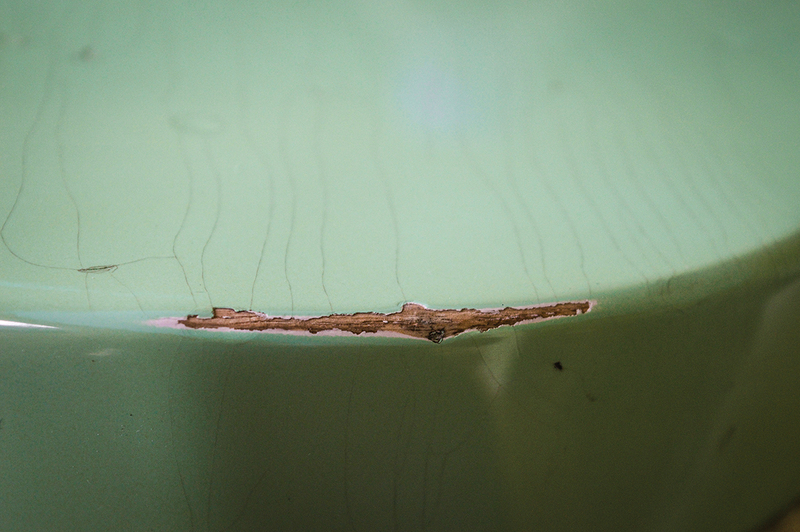 Remember to do the sides as well as the front and back – and be aware that the longer the drop, the deeper the dents. 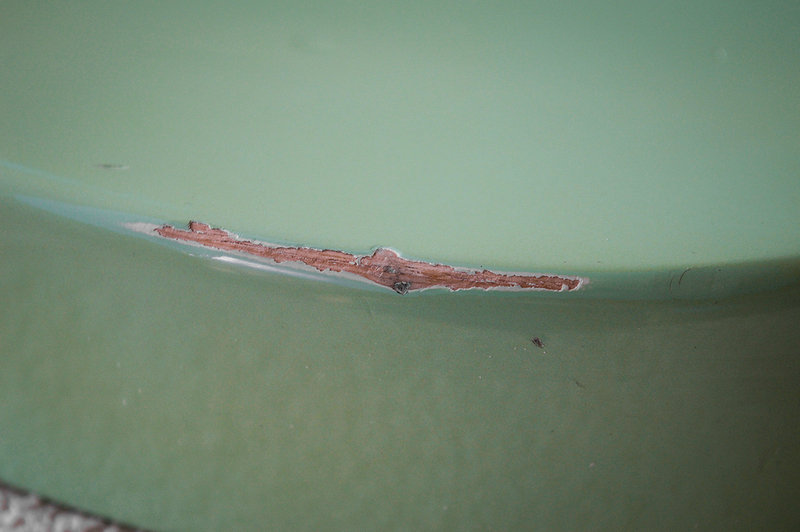 It’s actually quite hard to gauge because dents that are seemingly superficial can look far more prominent later on. Adding too many chips and deep dents can look a bit over the top. Before dinging up the finish, I fit the string ferrules, pickguard, bridge, neck plate and control plate because it’s unrealistic to damage the finish under those areas. Having them in situ provides a modicum of protection in the surrounding areas and will give you more realistic results. I also try to tap the finish strategically with blunt objects and screwdriver shafts. Achieving a convincing look requires variety and randomisation . You can go for larger chips around the edges, and I sometimes use a dental tool to flake off the lacquer. Look for pictures of genuine vintage guitars with the same body shape as you are working on and you will be able to identify the areas that tend to take the brunt of things and copy the wear patterns. I’m partial to a bit of rub-through on the upper bout, but many artificually-aged instruments are merely sanded in this area. When that’s done, you get to see the layers of tinted topcoats, colour and base coats and the wood beneath. 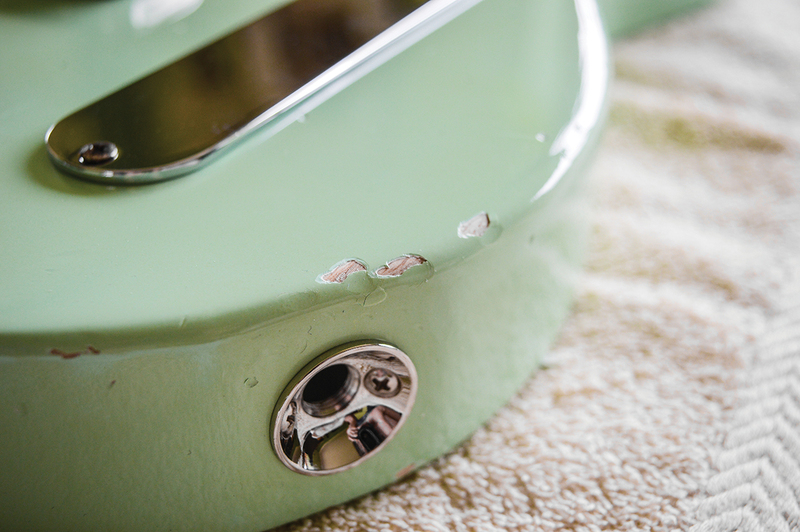 It’s a nice effect, but it’s rare to see genuine vintage guitars with that sort of wear – and the sanding lines can be a giveaway. In my experience, vintage edges tend to be more jagged and rough. To simulate the effect, I rub through the finish with slightly damp 1000 grit wet and dry paper, followed by finer grades of micromesh . It’s actually quite a slow and gentle process that doesn’t require specialist ‘tools’ such as bicycle chains or belt sanders. To achieve the jagged edges, I flake away the finish using my fingernails, taking care to avoid scratching or denting the wood. I don’t particularly enjoy this part of the process because at the end of it the body looks worse – more like a nice finish that has been subjected to random acts of violence. Fortunately, however, things start to improve from this point onwards. Almost every vintage guitar with a nitrocellulose finish will show some degree of lacquer checking. It’s caused by rapid fluctuations in temperature, and over the years can develop into intricate and fascinating patterns that many people find aesthetically pleasing. Needless to say, inducing lacquer checking is a fundamental part of the faux-ageing process. According to Edwin Wilson, the Gibson Custom Shop’s Historic program manager, lacquer from different eras checked in various ways depending on the formulation. So, on a 50s Les Paul you might expect to see the checking lines going from side to side on the body and headstock. 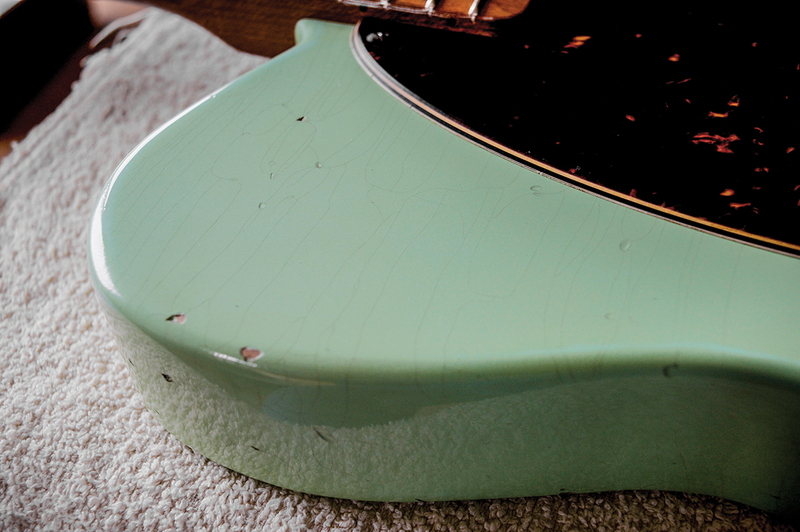 On 50s Fenders, the checking generally follows the grain lines, but by the time of guitars made in the mid-60s, when Fender was using Fullerplast as a base coat, the checking often ran side to side. Since it’s safe to assume that none of us is equipped or legally entitled to formulate our own lacquer, Gibson and Fender included, the technique used for getting lacquer to check has to be considered carefully. This is why Gibson Custom relies upon a method of razor-cutting checking lines into the lacquer that was made famous by the company’s ageing guru Tom Murphy. For the vintage reissue models to look authentic, the lines must have a specific look, so that cannot be left to chance. Others use the freeze and thaw technique, and for this you’ll need patience and a big freezer. 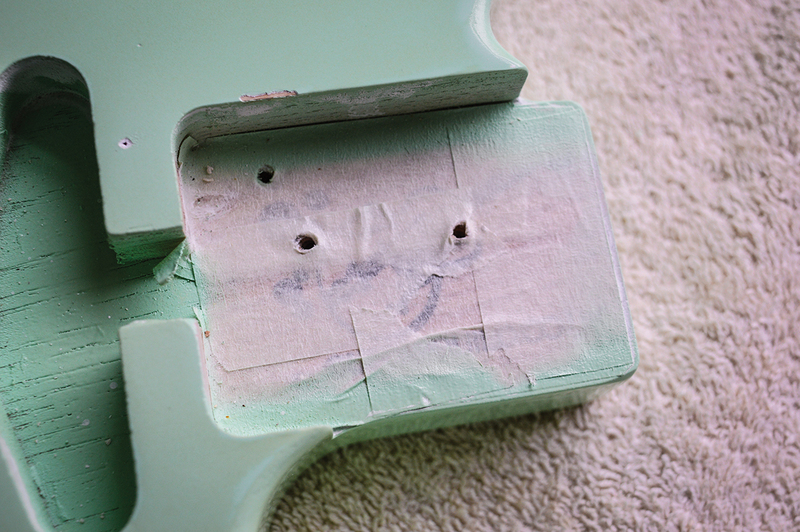 Simply put the guitar’s body in the freezer overnight, let it thaw out and repeat the process until you see checking lines beginning to develop. Sometimes, it happens straightaway, and sometimes several cycles may be required, but the results can often be excellent. For this project, I went with my usual method of heating and freezing. 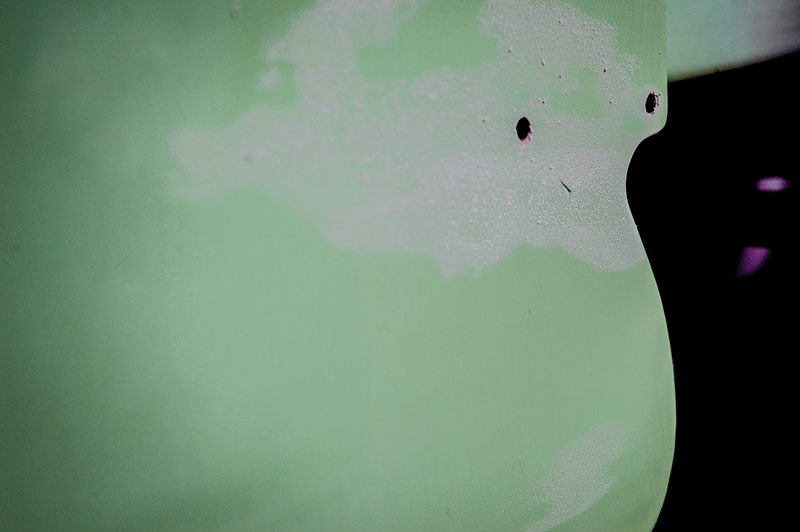 The heat comes from a hair dryer or a paint stripper gun. If you use the latter, select the lowest heat setting and keep the gun moving. Remember it’s a paint stripper, so it’s just as effective on nitrocellulose as it is on B&Q gloss. The cold comes from an aerosol canister of compressed air held upside down as you spray. Often sold as an air duster, if it says ‘do not use upside down’ on the can it’s probably ideal for relic’ing. It will freeze the surface of the body and create a layer of frosty water instantaneously – good for guitars, but bad for computers. There is a technique for doing this; gauge the temperature of the lacquer with your fingers as you’re heating it and don’t try to do the entire surface of the front or back at once. About halfway is about as far as you should go before you freeze it. I reattached my paint stick to the neck pocket to hold the body in a vice as I started checking the lacquer. Begin with the sides, apply the heat, freeze the heated area then wait a minute or so until the frosted layer melts off and wipe away the moisture. Remove the body from the vice and hold it up to the light to gauge your progress. At this stage, the cracks may be difficult to see, but once started they’ll develop naturally. There is an unpredictable element to this way of working, and the checking lines tend to go their own way. However, there are a couple of things to be aware of. Firstly, ensure that the compressed air is applied from a distance of 30cm or so from the body. 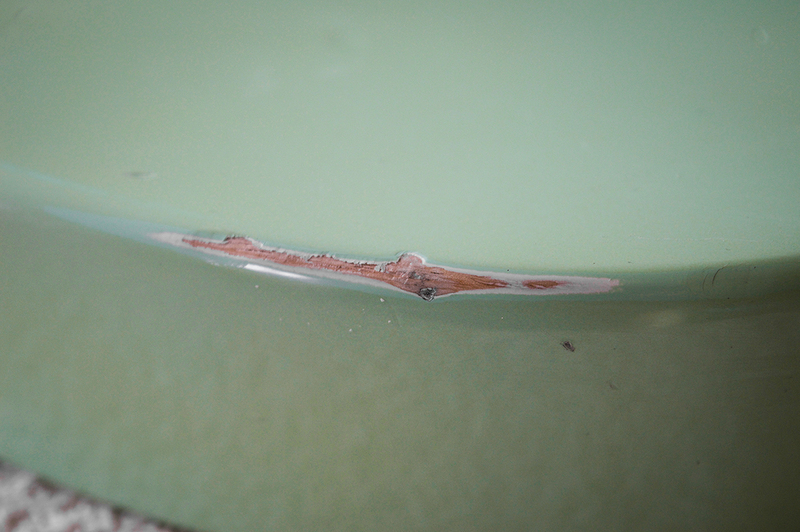 If you go any closer, the lacquer may end up with a ‘shattered’ look rather than checking lines. Secondly, be mindful of the way you move the aerosol. If the body is held upright and you move the aerosol across the body, the checking lines will generally follow the grain lines. For this project, the vice held the body sideways, and as I moved the aerosol along its length the checking lines formed mostly across the grain. Again, it must be stressed that this can be a fairly random process, but by following these guidelines you may be able to exert some degree of control. At this stage in the process, the lacquer checking may be visible only when the body is held at a specific angle to the light. The client had specified ‘exaggerated lacquer checking’, so I needed to make the lines more clearly visible. For this, I like to use Colron Jacobean Dark Oak woodstain because it’s water-thin and wicks straight down into the cracks. Wear plastic gloves, dampen a bit of folded kitchen paper with the stain and wipe it over the guitar. A little goes a long way, and you should work on small areas until you get a feel for the process. I leave the stain for a few seconds then wipe off the excess with some clean kitchen paper. The remaining stain can be removed with a cloth and a dab of Farecla G3 polishing compound, and the checking lines will show up beautifully against the clean finish. After a rub down with a clean cloth and some Farecla G3 polishing compound we’re left with this. Can you make out the lacquer checking? 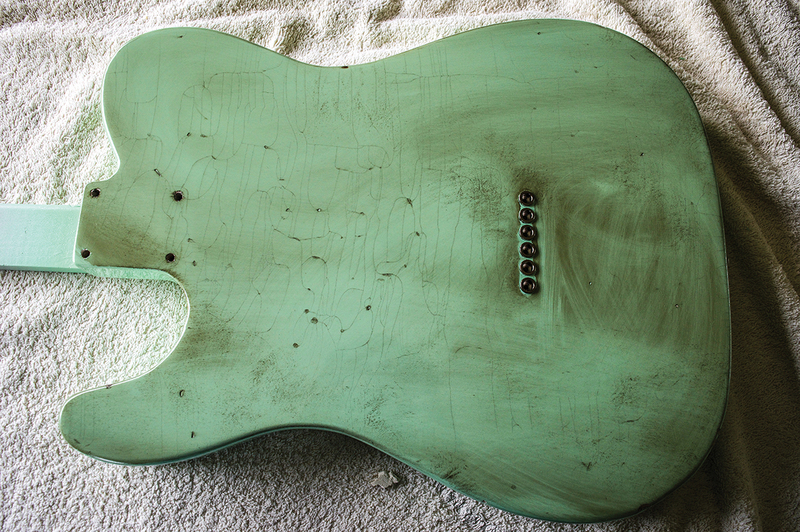 Although the stain can work wonders for the checking, when it has pooled up in the dents they can be over-emphasised and the guitar may end up looking a bit grotty. If this happens, dip a cotton bud into some clean white spirit and use it to swab out the dents. 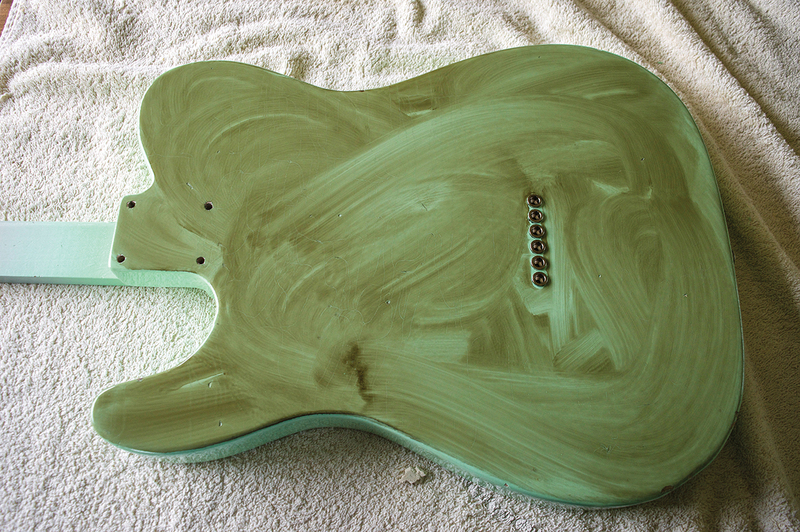 Some stain will be left behind but the guitar will look cleaner. Alternatively, if you like the ‘road warrior’ look, you may decide not to wipe off the stain completely, and leave it in the dents and some areas of the body. In fact, I left some of the surface stain where it had pooled up around the string ferrules because I thought it looked cool. Let’s hope the owner doesn’t hit me with a dry cleaning bill somewhere down the line. Ultimately, the process of artificially ageing guitars is something that requires practice, and you will certainly develop a feel for it over time. I’ve detailed the processes that produce results that I find pleasing, and if you like the way this body has turned out they might work for you too. However, there are other methods that are equally valid and you may wish to try those instead. Since the object is merely to create a look that has the vibe you want, there is no right or wrong way to do it. After all, faux ageing is by definition… faux. 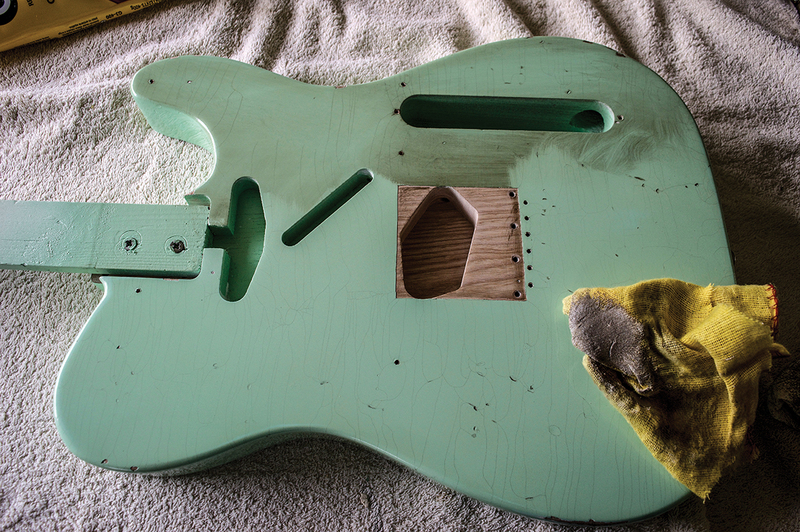 Unfortunately, finishing a body in nitrocellulose can cost £100 or so just for the lacquer, plus it requires a lot of time and careful work. Experimentation is therefore expensive in many ways, so work slowly and methodically. Remember that you can always add to the distress but not take it away.